Today we are back at my new favorite South Dakota birding spot. If you recall, I have had a number of posts already from Lake Andes thanks to the very successful birding outing we had there while making a brief stop on our way to Yellowstone National Park. As mentioned numerous times before, for a spot that had zero people visiting while we were there and little to no advertising in or around this specific location but for a small sign in the parking lot, this location provided a wealth of new fodder for the blog and numerous ticks on the Bird Life List. Pretty much the Henderson Bird Viewing Preserve equivalent of the South Dakotas! 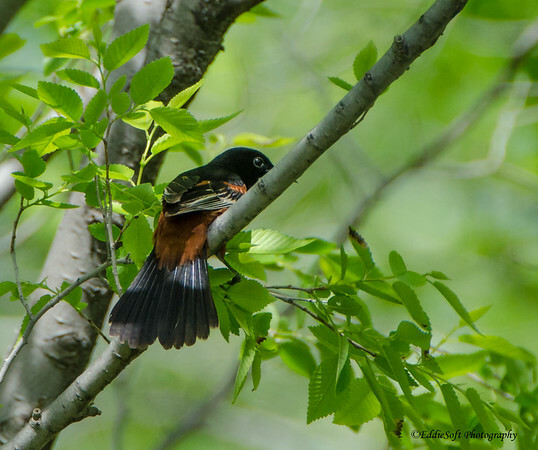 With that, I’d like to introduce you to the newest member of my birding list, the Orchard Oriole. Truth be told, I had no idea what species this bird was while out in the field snapping the shots. 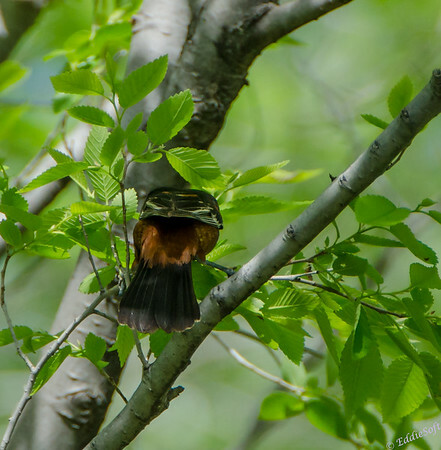 Initial guess was a molting Oriole only because it was similar to the Baltimore Orioles I’ve seen, but a lot duller. The Baltimores wear a brilliant shade of orange compared to this specimen. It did sport that daunting dagger of a bill found on Orioles and quite frankly was as flighty as those more colorful versions. Up, down, left, right, near, far … the damn thing wouldn’t stand still long enough for me to get a good angle on it. It is a miracle the Beast was able to catch it, much less get all the critical angles to help identify it in the digital darkroom. Although it would have been ideal to get more of the bill in the next shot, it is still my favorite of the lot since it gives a nice view of the markings making it super easy to identify. Hit the jump to read a bit more about this interesting bird. Unlike its fellow Orioles, the Orchard is naturally more rust colored and probably the least vibranced of them all. I still like the overall palette and think they have an aura of sophistication about them where the other Orioles are all about the flash (ha). Should I take it personally that 90% of the time this specimen was busy mooning me? While researching this particular bird it became apparent that we were in the right place at the right time to get him in the tin. They only spend their breeding season in North America (mostly in the Western half) before booking it back to Central America where they spend the rest of the year. This specific specimen is an adult male since the females and juvis take on a more dominant yellow coloring – juvis have a black patch on their throat on down from their bill. 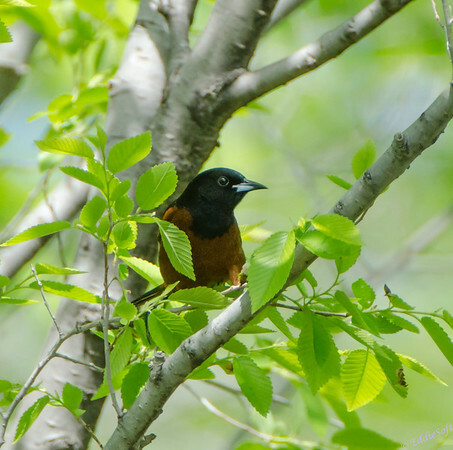 The Orchards are the smallest of the North American Orioles. They live off of insects and flower nectar. 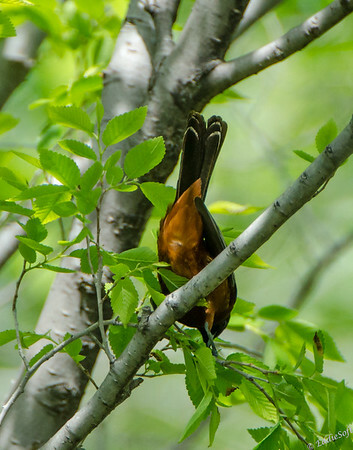 Unlike those evil Blue Jays, these birds appear to be cordial to their neighbors living in harmony with the other Orioles and fellow tree mates (of course, the insects they prey upon probably have a more slanted opinion). Oh, and they are quite the comedian when it comes to showing their opinion of people with big glass interrupting their foraging per the visual below. Guess I’ll take that cue and put an end to today’s post. Hope you enjoyed reading about my new entry on my Birding Life List. Nice pics! I’m trying to figure out how you get such brilliant lighting in your shots. Mine turn out kinda dull, even after editing in Lightroom. Maybe I need more highlighting. Any tips would be appreciated! I can walk you through my digital darkroom workflow sometime (family benefits). To be honest, it starts on Manual mode which is the only setting I shoot unless I need to make Linda concerned and start shooting waterfalls on S. Beyond that it is pretty much trying to shoot with my back to the sun and admittedly some luck when it comes to the more hyper birds – plus you only see the shots I want you to see – there are thousands left on the darkroom floor.